The last time I was in Berlin was for a conference, scheduled for 8-10 November 1989. I had lived and worked there from 1968 to 1972, and it was then “West Berlin”. My parents lived off the Heerstraße, near the Corbusierhaus and the Olympic Stadium; I worked during vacations at Smuts Barracks, an old Horse Transport barracks used by the British Army for its squadron of Centurion tanks (they didn’t bother to station any Chieftains in Berlin) and as the maintenance centre for all the civilian and military buildings it occupied in the British Sector. In the summers there would be the odd sonic boom, as the Soviets maintained their low level harassment; and of course the East Germans ran the S-Bahn throughout Berlin, a cheap but very rackety urban railway. We lived on the fringe of the Grünewald, a vast wood in the centre of Berlin between us and the Wannsee, on which I rowed during the summer vacation. 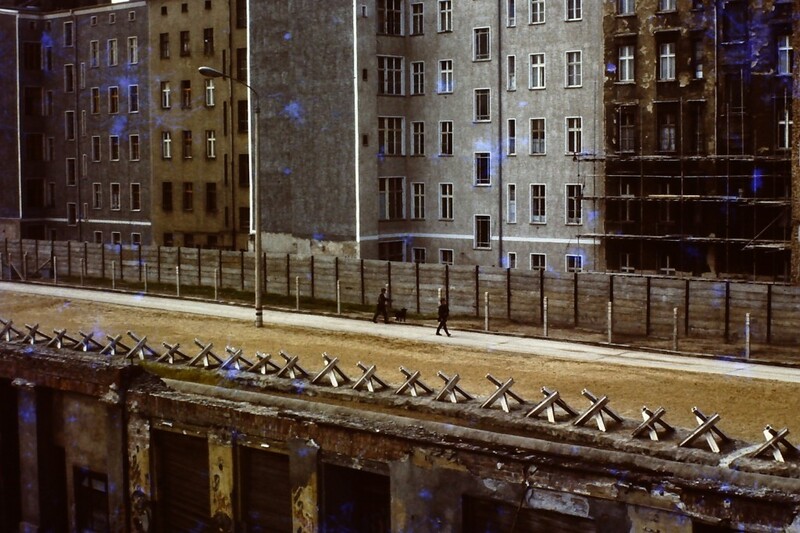 Of course, you could only go into East Berlin with a military car and driver, because the Wall separated West from East; so you never ran across anyone who lived outside West Berlin. In November 1989 I was attending a conference at the Wissenschaftszentrum, and staying with friends (the Meilings, with whom I had rowed on the Wannsee) down in Dahlem. Early on the morning of 10 November I got the U Bahn to Kurfürstendamm, walking the rest of the way to the Landwehr Canal and the Wissenschaftszentrum. There was hardly anyone around, but then a man asked me where the Kurfürstendamm was. A strange question, since it was just behind me. But he looked a bit out of place, dressed rather differently to the average West Berliner; he was German, but not knowing where the Kudamm was? So I pointed the way. Then someone asked me where he might change some money; I suggested a bank. And then what I immediately recognised as an East Berlin radio taxi came around the corner, and I knew that something very strange indeed had happened. During the morning a constant stream of people followed the Landwehr Canal to the Kudamm, a place they knew about but which was not on any of their maps of the city. At lunchtime we took a break and walked across the Tiergarten to see the Wall, a very busy place with people sitting on it, film crews interviewing them; I saw Willy Brandt at the Brandenburg Gate. I had left my Nikon in Dahlem. By the evening joy riders in Trabants had penetrated to the suburbs, doing a tour of a city they had heard of, but never visited. I was in Mannheim during December 1990 for the first post-Unification election, and a depressing affair it was. Helmut Kohl was riding a wave of popularity; Unification, he said, “would not cost a single pfennig”. Well it did. When they wound up the Treuhand a figure roughly equivalent of the GDP of Austria was added to German public debt in one go. Looked at another way, this sum was roughly half contemporary British public debt. The only bright spot was that the infrastructure of the former GDR was in such a poor state that it had to be replaced wholesale, a one-off upgrade at an important point in the development of new technologies of communication and environmental safeguards. The former FRG economy swallowed all this without blinking much, along with a major influx of “ethnic Germans” from the former Soviet Union whose numbers dwarfed those bandied about today in UK immigration debate. This was nothing new: in 1950 some 20% of the population living in the territory of the FRG were refugees and stateless persons of one sort or another. Every few years some pundit or other writes about the impending “slowdown” of the German locomotive. Some locomotive. Kohl was never a great strategic thinker. François Mitterand on the other hand did have a plan: to maintain French influence and bind Germany into the new Europe by creating a single currency, in which Germany would have to surrender the Deutschmark, a currency that had retained and increased its value more or less continuously from 1950 to 1990. Critically, Mitterand had the support of his friend Margaret Thatcher on this. 1992 was the year in which the Single Market Programme terminated; at Maastricht in February 1992 Kohl agreed to move directly on to the creation of the euro. This entry was posted in Germany, Unification and tagged Berlin, Berlin Wall, November 1989 on November 8, 2014 by Keith Tribe.